Those traps aren't going to catch anything if they are in the garage. I realized recently that I hadn’t scheduled How I Hang a Swarm Trap for publishing yet. If you are interested take a look at it and get some traps out there. A lot of beekeepers think that the swarm season is only about a month in the early spring, but I have caught swarms all throughout the summer. If you are just getting your traps ready and up don’t think it is too late. I take issue with the old adage, “a swarm in July is not worth a fly”. That July colony may not produce a honey crop for you this year, but if it overwinters they may produce one the following. If the July colony fails to overwinter odds are you will be able to harvest some of the brood combs for next years swarm traps. That’s worth something to me! It all depends on the focus of your operation. Are you focusing on honey production alone or are you looking for bees that can overwinter? I believe you can pursue both goals. I heard an interview on a bee podcast once. The guy said something that we all need to remember. “Dead bees don’t make honey”. I am sorry I cannot remember who it was. I believe that if you focus on keeping colonies that can consistently overwinter then you can select for honey production. More on that in the future when I publish my Principles page. In closing I had a couple of traps that were 50 miles from my house last year. I didn’t get them down by mid July. Both caught swarms in the first week of August. One overwintered and one did not. The surviving colony though light this spring has been making serious headway. The other one supplied dark comb that I am using in swarm traps. The moral of the story is I DON’T CARE IF IT IS MAY 7th, you still have time to make some traps and get them up!!! Good luck! 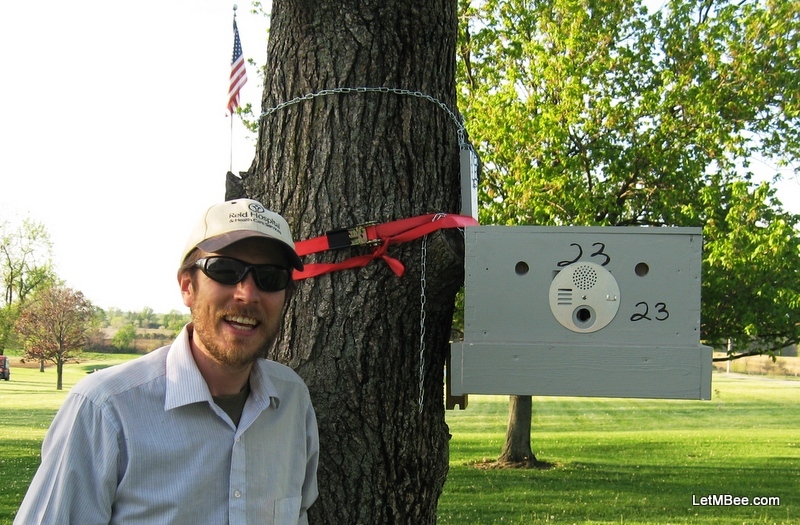 This entry was posted in Feral Bees, HowTo, Posts, Swarm Trapping, Uncategorized and tagged bait hive, bee, beekeeping, feral bees, feral hives, foundationless frames, hang swarm trap, Indiana beekepeing, Jason Bruns, Swarm, swarm trap, swarm trapping. Bookmark the permalink. lol, yup get em UP! If they are late you might need to feed them (even though I don’t like it) they could be great colonies just a little late. I didn’t feed any of my bees at all last year. I even had a couple that were caught in August. Not all of them made it, but the ones that did are booming this year. The way I look at it feeding may be good for one particular colony, but it is bad for my genetic program on the whole. If I have to feed this year, I will probably have to do it next. I just refuse to start. Agreed. Bees are bees. Plus, if they overwinter, another pool of genetics for the honey bee species to choose from. I have determined that a lot of people’s opinion is formed because they only try something 1 particular way. That’s flawed logic as far as I am concerned. I really take Langstroth’s advice to heart. I think it is wise to ALWAYS be experimenting with little differences in your operation. NOT experimenting on all of your hives, but always have a small percentage of them that you are trying to learn with. Beekeepers get in a rut with time. I was told back in 2010 by someone who had been keeping bees for 50-60 years that I would be out of the bee business pretty quick trying to catch them in boxes “because all of the feral bees died”. The reason that guy thought that is because he hadn’t been looking for feral bees. The more places I looked, the more places I found them…. If you find that bees in your area either prefer or DO NOT prefer vent holes get back with me. I will pass it along. I want everyone to catch their bees and quit wasting money on packages….